you can do it daily except Mondays between 9:00 and 16:00. If you love Christmas and their charming atmosphere, do not miss an exhibition in Fata Morgana's glasshouse called The Christmas Spell. Whether you are a fan of fashion trends or traditional arrangements, you have a lot of inspiration and ideas for the original decoration of your home. "At the end of the year we have prepared for our visitors an exhibition inspired by the current trends that have been chosen by the leading florists and designers for this Christmas," says Bohumil Černý, director of the Botanical Garden of Prague. m. Prague. Do you think about how you make your apartment more beautiful this year, and you lack inspiration? Come to Fat Morgana Greenhouse, where the exhibition devoted to festive decorations takes place until January 1st. "During the preparation of the exhibition, we came out of three main trends, chosen by the leading florists Klaus Wagener and Marion Bauer this year. Visitors will present a charming heavenly Christmas combining a palette of subtle colors with glittering accessories. 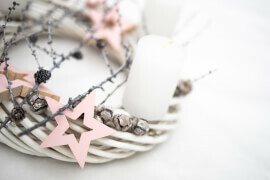 Comfortable Christmas hygge or Danish lifestyle are full of harmony, radiating joy and comfort. They combine gray and kerosene tones with matte and shiny shades of gold and brass, "says Radka Pšeničková, Deputy for Marketing and PR. And he adds: "The latest trend is the natural style based on a wide range of earthy shades of natural wood combined with red, gray and silver. The atmosphere of the homes of our grandmothers is breathtaking from individual arrangements, characterized by simplicity and playfulness. " Part of the exhibition is an original nativity scene decorated with a variety of natural materials, especially with the stucco. Joseph, Mary and Little Jesus, remind small and large visitors of the spell of Advent and the approaching Christmas Eve. Take a walk with Fata Morgana to your partner or partner and kiss on the greenhouse terrace under a hanging mistletoe. This nice advent habit will ensure that your love lasts for the next year. Experience the romantic atmosphere of Christmas in the tropics. Christmas Fata Morgana Greenhouse Exhibition will present original Advent and Christmas arrangements made from natural materials. There will be no untraditional nativity scene. Experience Christmas in the Tropics!